Many homeowners would like to have a walk-in pantry, but their kitchens simply don't have enough space to build one. Although they were once standard in every country farmhouse, walk-in pantries are considered a luxury feature nowdays. A refrigerator with upper and lower kitchen cabinets is the standard food storage arrangement in most homes. However, owning a modest home with a tight kitchen does not have to end any hope of having a dream pantry. 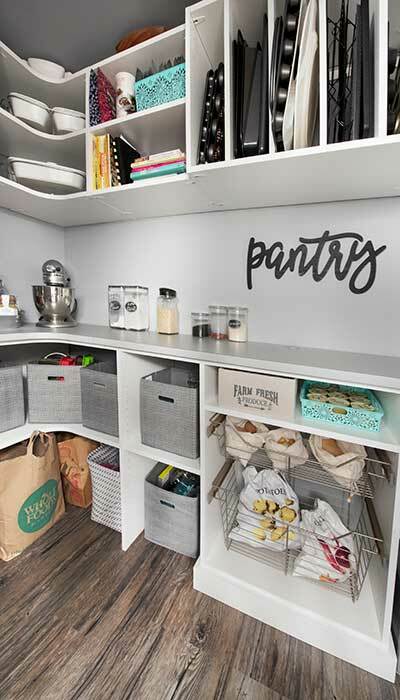 A little creative thinking can target other places in the home where a pantry might fit. A back hall, mudroom, or laundry room are all places that might be able to handle a bit of additional storage. If none of those spaces will work, think about utilizing the the basement as in this example from one of our recent customers. It's hard to believe that this pantry closet is in a corner of a windowless basement. 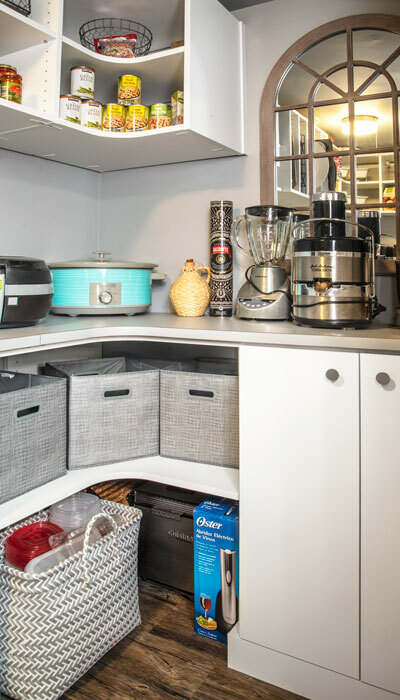 Located just below the kitchen, it's a convenient storage annex for items that simply won't fit in the regular, above ground kitchen cabinets. The space is made to feel lighter and brighter by hanging a window casing/frame fitted with a mirror instead of window glass. The mirror reflects as much light as possible into the space and mimics a real window. 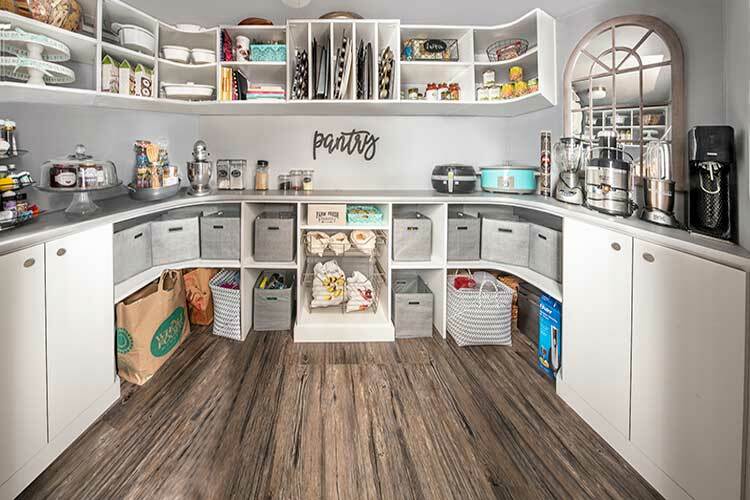 The pantry offers abundant countertop space as well as storage, functioning as an extra prep area during parties. Closet Works recently added a beautiful pantry to a small home by using some of the basement space directly below the kitchen. The 1950s ranch style home was a cute house in immaculate condition with an adorable little kitchen in the back. The drawback was that "little" didn't cut it for this amateur chef's culinary needs. She needed more cabinets and countertops to keep all her food preparation gadgets organized in addition to more overall storage space for bulk foodstuffs. The home's small kitchen couldn't accommodate any additional cabinetry or pantry storage shelves. Finding a solution meant that we had to look to the past as a way to solve the client's 21st century needs. When our country was first starting out, nearly every home had a root cellar under the kitchen. They used it as a way to help preserve root vegetables and keep food cool and dry before refrigeration, but an added benefit was that it definitely increased the usable storage space in the kitchen. We needed to add a modern twist to the tradition of the root cellar in order to make this kitchen work. The subterranean room for the new pantry was created by the customer. A section of the original basement laundry room was sectioned off to make a dedicated pantry area for food and small appliance storage. We did a variety of revisions to this space to accommodate items the customer wanted to place in the area. Vertical tray dividers and open shelving for casserole dishes dominate the upper, suspended storage section. Heavy items like canned goods, beverages and potatoes are stored on the lower, floor-based storage shelves. Two corner cabinets received doors to hide small appliances and gallon size containers of vinegar, olive oil and other sundries, but the bulk of the storage is in the form of open shelving. This keeps all the foodstuffs visible. A long countertop divides the upper suspended shelving from the lower floor-based shelving. This gives the homeowner extra food prep space when cooking for large gatherings. We stuck to a white and light gray pallet to keep the space feeling airy and bright, avoiding any sensation of oppression from being underground. The base cabinets are floor based and can hold a lot of weight. However, the base shelving has no base moulding. This allows the client to slide the largest, heaviest objects on the floor. We purposely ended the upper shelves on the right side of the pantry so that the client would have room for her mirror-in-a-window frame. It was important to her to have the sensation of being able to look out of a window while working underground. Pull-out wire baskets were included for root vegetable storage, offering a nod to the past in this otherwise thoroughly modern space. Putting a modern twist on an old concept like the root cellar is a good way to add needed storage to the home. The trick to working with smaller homes is to think creatively about the space you do have — even considering the basement as a place for food storage. That way, even little houses that don't have a lot of space in the kitchen can enjoy the luxury and convenience of a new walk-in pantry.